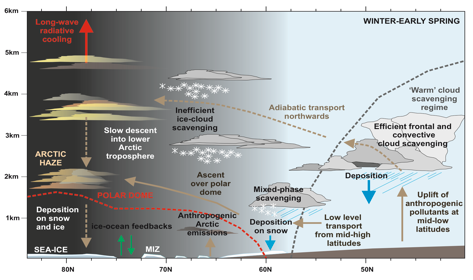 WG1 is tasked with developing approaches to reduce model uncertainties regarding the processing and impacts of remote and local Arctic pollution sources. One approach currently under development is a targeted campaign--IMPAACT--which will use airborne and ground-based measurements to evaluate and constrain treatments of processing and loss of aerosol and trace gases affecting the Arctic, across a range of numerical models. Cloud processes strongly influence the efficiency of transport of pollutants to the Arctic from mid- and high-latitude sources. The IMPAACT (Investigation of Multiscale Processes Affecting Atmospheric Chemical Transport) is described in this prospectus. Planned for springtime in 2020 or 2021, IMPAACT will be composed of three main efforts: IMPAACT-Asia will examine the efficiency with which pollution is carried from eastern Asia into the troposphere of the North Pacific and the chemical transformation of these pollutants. IMPAACT-Arctic will investigate the continued evolution of this pollution as it is transported into the Alaskan and Canadian Arctic. IMPAACT-North America will quantify the characteristics of the pollution as it enters the heavily populated coastal areas of western North America and its impact on regional air quality. Measurements for IMPAACT will include airborne, surface and remote sensing observations in all three venues, tightly coupled to model investigations on a variety of scales. Contact Charles Brock for more information regarding IMPAACT.